Not satisfied with the commercially produced mattresses available today? Have you ever wonder how to make your own? Well thank goodness the Wyoming Agricultural Extension Service (now the University of Wyoming Cooperative Extension Service) can help! 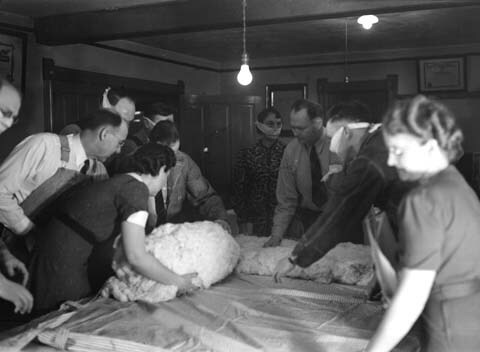 Since 1914, in addition to providing advice on livestock and crops, the Extension Service provided folks with demonstrations and workshops on everything from canning garden produce and sewing clothes to how to use color in home decoration and how to refinish furniture. 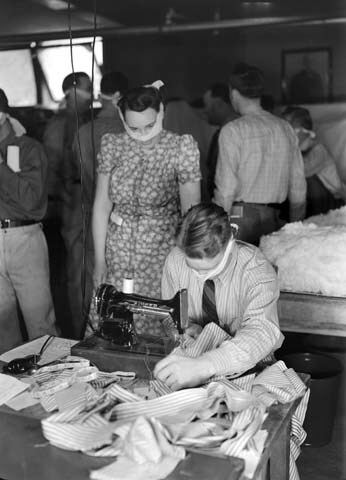 In this series of photos from the 1940s, Wyoming Home Economics Specialist Pauline Bunting helps an unidentified community group stitch and stuff mattresses. Between 1987 and 1989, the Wyoming Extension Homemaker’s Council interviewed many of the long time homemakers club members about their experiences with homemakers extension clubs over the years. Many of these women started in the clubs in the 1930s and 1940s as new brides. 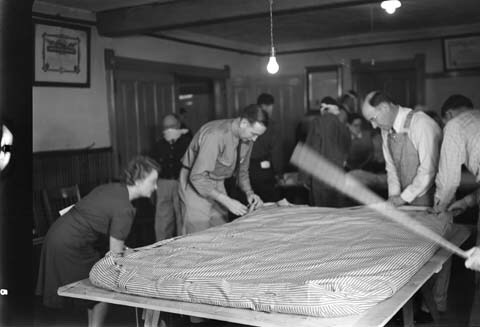 Several mentioned community mattress making projects and demonstrations like this one during their club days, and especially during the early 1940s and World War II. The first step was to make patterns and cut out the ticking for the mattress covers. Ticking is the sturdy cotton fabric used for mattress and pillow covers. It is usually off-white with brightly colored pin-stripping. 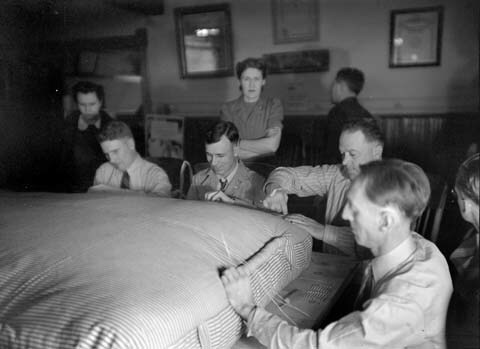 Here an extension agent helps a man sew the ticking together for the mattress cover. They are wearing bandannas over their noses so they do not breath in the fine cotton dust. Weighing cotton for stuffing the mattresses. Notice the bandannas again. 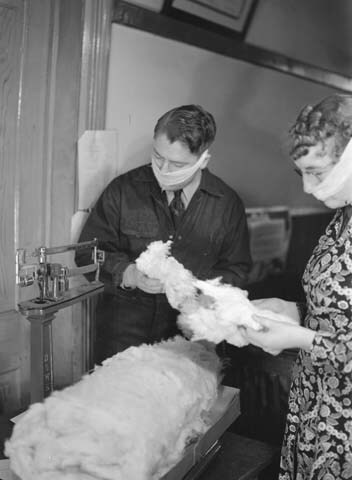 Cotton came in large bats and the cotton was weighed out to ensure each mattress received its fair share. 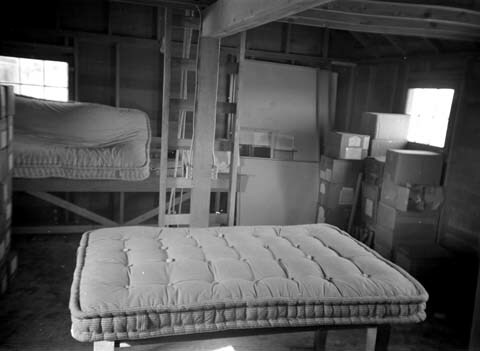 According to a 1940s USDA circular, 50 pounds of cotton went into each mattress. Rolling out the cotton onto the ticking. Rolling rather than stuffing produced a more even mattress. Then it is time to add the top ticking and stitch it to the sides. The stick that is waiving in the foreground is a broomstick used to beat out the lumps in the stuffing. After the ticking is sewn closed, a welt was sewn around the edges to give it shape and keep it square. Look how handy these men are with those long needles! 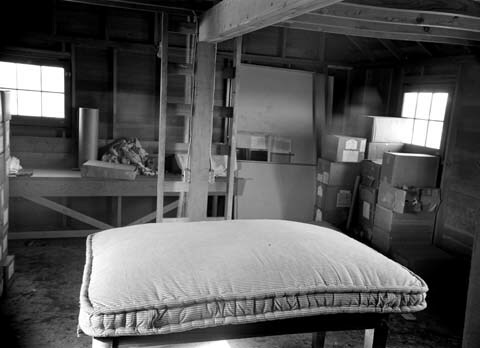 The mattress was then couched to keep the stuffing from shifting. Couching is a process where you attach buttons to each side of the mattress and pull them tightly together. The buttons keep the thread from pulling or wearing holes in the fabric. The finished mattress is ready for a bed and a good night’s sleep after all that work. For more information, take a look at this wonderful ca 1940 circular from the USDA encouraging farm families, especially in the south, to turn surplus cotton into mattresses. 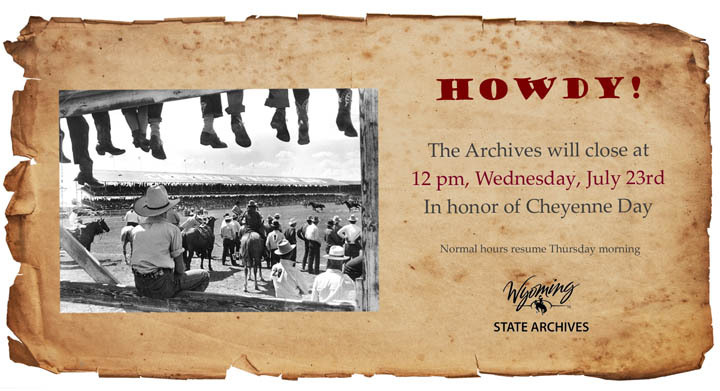 Thanks to our friends at the National Agricultural Library Special Collections for digitizing this gem! The first entry in “Records of the Probate Court, Green River, UT” predates Wyoming Territory by 8 years. One of the oldest local government records in the Wyoming State Archives dates from the years before Wyoming Territory was created. 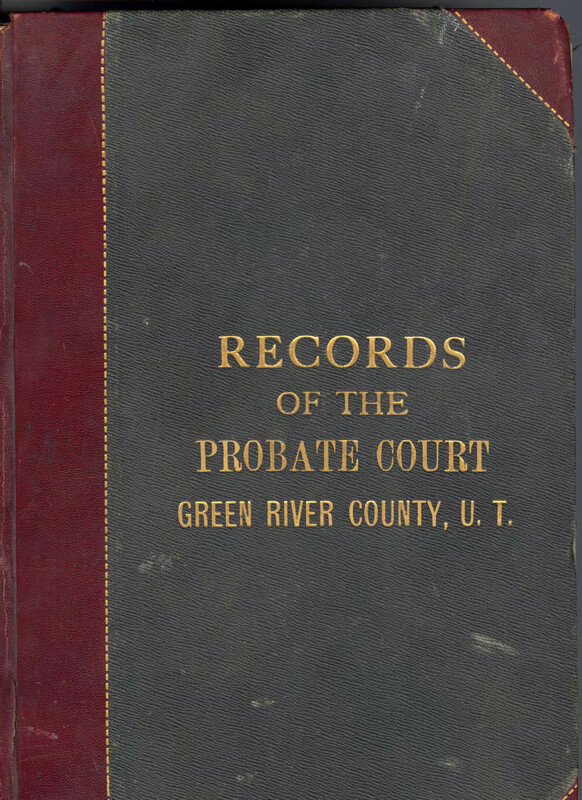 The bound volume is titled “Records of the Probate Court, Green River County, U.T. [Utah Territory],” and covers the years 1861 to 1871. The southwest corner of what would be Wyoming was part of Utah Territory for 18 years prior to July 25, 1868, when Wyoming Territory was created. In addition to recordings related to probate matters, the volume includes information normally maintained by a county clerk. One of the very first cases handled by the probate court of Green River County was to settle the estate of Michael Martin in 1861. 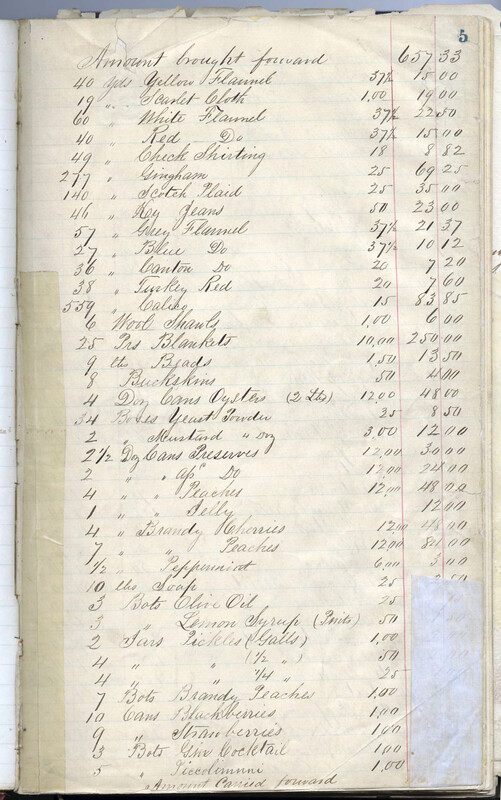 Looking at a portion of the inventory of his estate, it appears that he ran a general store. Bolts of cloth, jars of pickles, barrels of crackers, tobacco and pipes, cans of fruit and even “stomach bitters” appear on the list along with their valuation. In 1869, the County Clerk recorded the contract between Charles P. Regan and James Bright for the sale of the Fort Bridger Brewery. Bright promised to pay $2,500, which is equivalent to approximately $43,000 today. 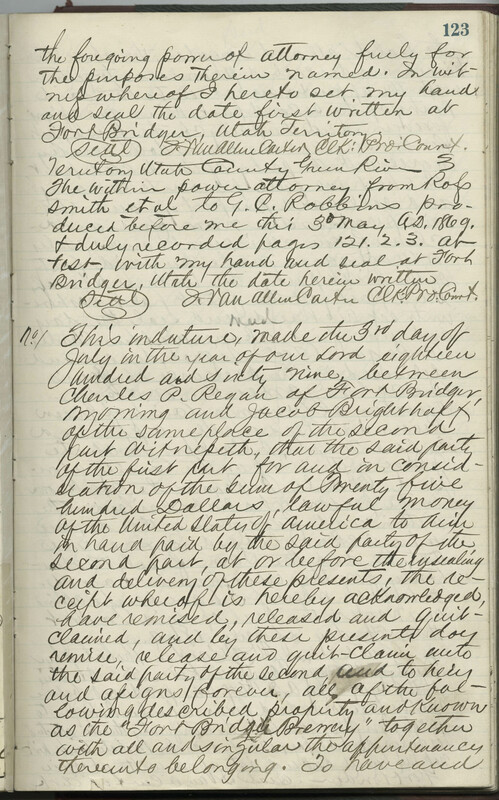 Much of the volume contains records of the County Clerk. A variety of instruments were recorded, such as homestead claims, mining claims, chattel mortgages, bills of sale, powers of attorneys, and a lengthy record concerning the issuing of bonds for the Union Pacific Railroad. Some references are made to the re‑recording of these records in volumes maintained by the county clerk, which is probably the newly created Uinta County Clerk. An index is included at the beginning of the volume. 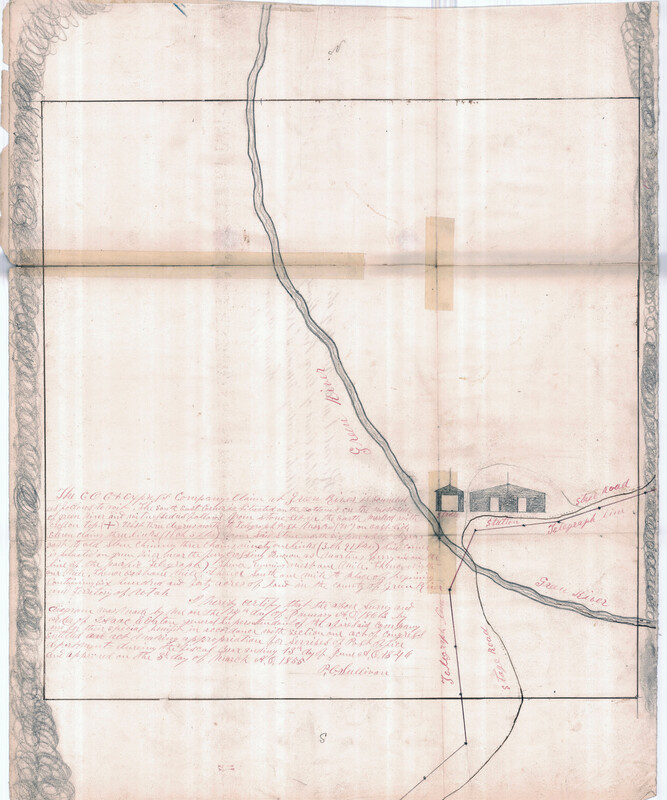 Overall, the record provides information about early settlement and property holders in the southwest corner of Wyoming. This map, filed with the county clerk, shows the location of the Central Overland California and Pikes Peak (COC &PP) Express Company in 1862. Wyoming historian Charles Giffin Coutant was born on October 16, 1840 in Rosendale, New York. Orphaned at seven years old, he spent the next seven years on his uncle’s farm. At the age of fourteen, he started his newspaper career as an office boy for a New York City publisher. Eventually, Coutant became a roving reporter, writing about life in California for his New York audience in 1859, and visiting Mexico for the same purpose. He also covered Civil War events and military conflicts with Native Americans. Coutant’s first marriage to Carrie (maiden name unknown) ended with her death in 1863, leaving him with their two children, Clarance and Wilbur. Coutant married Mary Elizabeth Clark of Boston, Massachusetts on Christmas Day, 1867. They had six children: George, Walter, Charles, Laura, Georgia, and May. Charles G. Coutant collected biographical information about many of Wyoming’s prominent pioneers as well as the general history of the state. He had planned to publish a three part History of Wyoming, but only completed the first volume. Moving west, Coutant continued his journalism career in Kansas, where he served as editor of a Topeka newspaper. He originally came to Cheyenne in 1890. 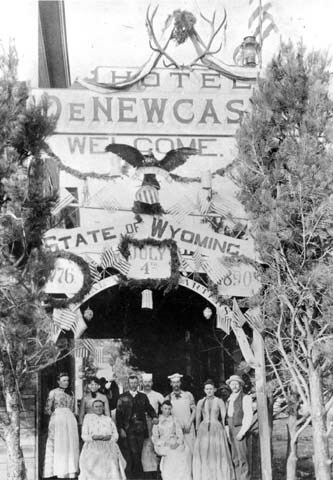 After brief stays in Lander and Laramie, he returned to Cheyenne in 1899. 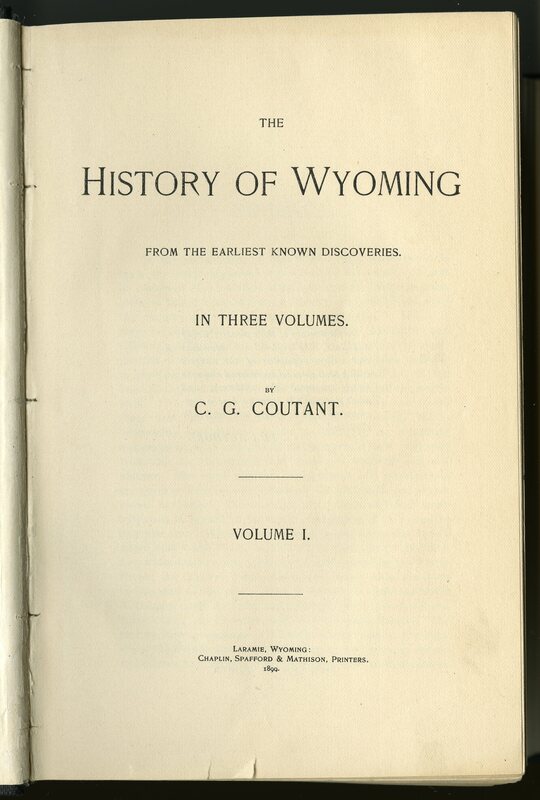 That same year, Coutant published the book, The History of Wyoming From the Earliest Known Discoveries, Volume I. He did not complete the anticipated second and third volumes. The title page of Coutant’s History of Wyoming, Volume 1. He inscribed the book to “the memory of those pioneers, living and dead, who explored our mountains and valleys…” Coutant claimed in the preface that “it will be observed that, with a single exception, every account given is based upon authentic history; the exception being the chapter devoted to “Spanish Occupation”.” This first, and only, 700+ page tome covered the pre-territorial period, from earliest exploration through about 1869. 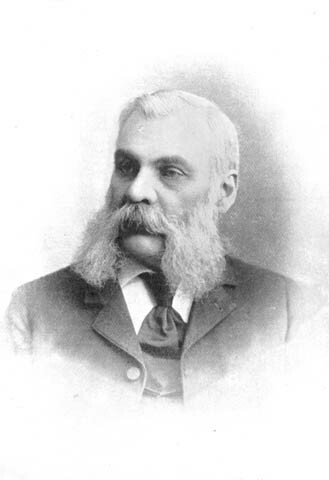 Coutant was the Wyoming State Librarian from 1901 to 1905. He also held the position of Secretary of the Wyoming Industrial Convention for four years. After a lengthy visit to Alaska, Coutant relocated to Grants Pass, Oregon in 1908, where he edited the Daily Courier newspaper. Coutant died at his home in Grants Pass on January 17, 1913. Examples of the biography notebooks Coutant kept while researching for his history book. 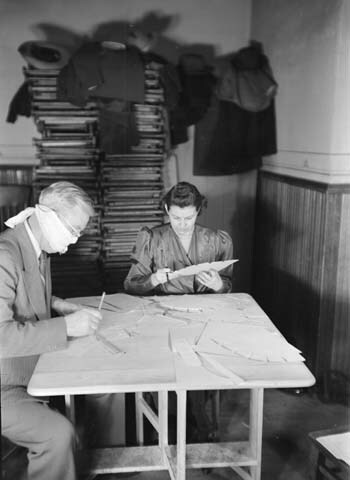 The Wyoming State Archives’ Coutant Collection consists of biographies and assorted Wyoming history material that was probably intended for the unfinished History of Wyoming volumes. The majority of the collection dates from the late 1890s to the early 1900s. Topics include prominent citizens, Indian Wars, Army activity, early territorial settlement, county histories, ranching, and farming. The biographies include prominent citizens, primarily wealthy and influential men, from the territorial period to early statehood. There is also correspondence to, from, and about Coutant. This collection is a good source for genealogical research and social history and related photographs are also available. 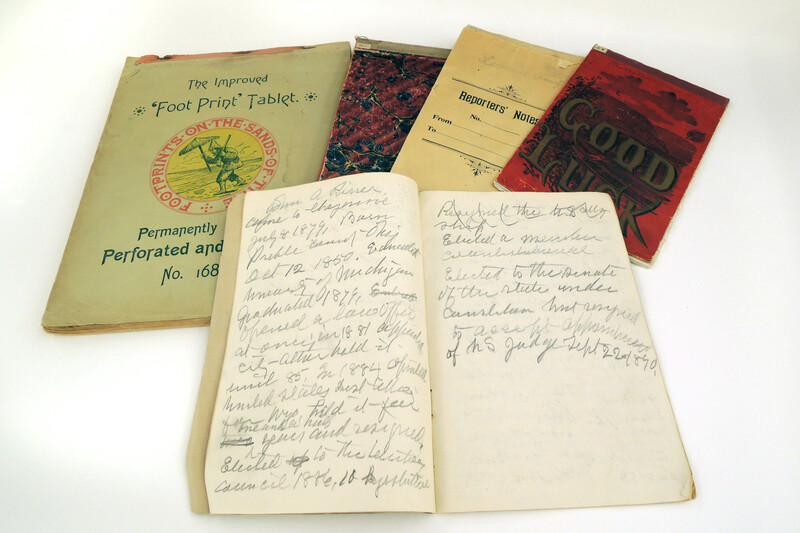 A complete inventory of the collection is available in the State Archives reading room or here in the Rocky Mountain Online Archive (RMOA). 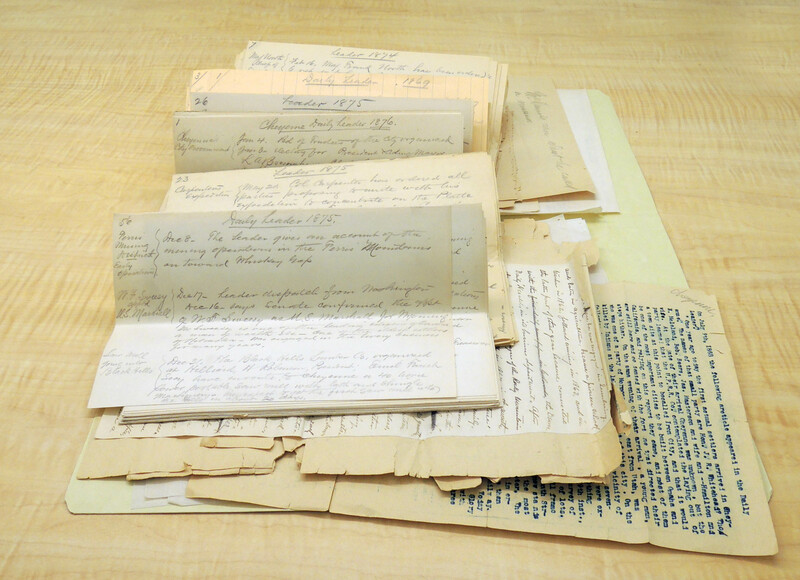 Coutant transcribed newspaper accounts and collected stories from locals while researching for his subsequent books, which were never completed.